"Randy the Raindrop: I'm a Little Raindrop" is the story of an adorable cartoon raindrop that makes his way from the sky to the ground as the rain falls. Randy enjoys his adventure of falling to the ground and playing with kids along the way. Babies and children will love the colorful illustrations in the book along with the gentle rhyming story. The story also gives a general outline of what happens with a real raindrop when it falls and evaporates through the adventures of Randy. 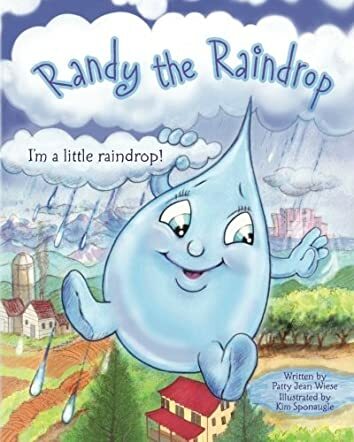 At the end, your little one can sing the 'I'm a Little Raindrop' song, learn some fun weather facts, and explore more "Randy the Raindrop" activities online. This is a fantastic book for children of varying ages. It is geared towards preschoolers, but the way the book is set up allows for younger and older children to also enjoy it. The illustrations by Kim Sponaugle are remarkable and will capture the tiniest baby's attention as the words are read aloud. Preschoolers will also love the colorful pages as they read along with their parents. Even school age children will want to read Randy themselves and learn about weather from the fact page at the end of the book. Children of all ages will want to sing the 'I'm a Little Raindrop' and then go online to hear the song. This book incorporates more than just a children's story by adding the song and facts to the book, but then takes it one step further by developing a website where children can complete activities based on the book. Patty Jean Wiese has created a great concept that will capture the attention of children and the admiration of parents everywhere.